In the 1970’s Chogyam Trungpa Rinpoche founded Vajradhatu, the umbrella organization for the many Buddhist centers springing up in the West under his direction. The Milwaukee Dharmadhatu, founded in 1979, was one of those centers. In its formative years, the Milwaukee center was housed in a storefront on East North Avenue and later expanded to North Hackett Avenue, where seminars and programs on Tibetan Buddhist meditation and teachings were offered. In 1993, the community purchased the building at 2344 N. Oakland Avenue. In the late 1990’s the name of the parent organization, as well as all of the local city centers was changed to Shambhala, to reflect our central commitment to the teaching on Creating Enlightened Society. Over the last thirty years, our membership has grown and we’ve become connected to the community in diverse ways, from teaching University courses for credit, to working with inmates through prison dharma programs. 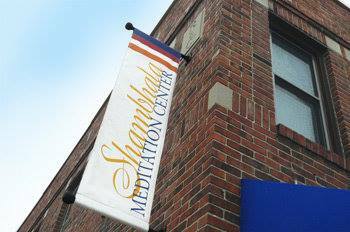 The Shambhala Meditation Center of Milwaukee continues to bring the distinctly contemporary and effective spiritual path of the Shambhala teachings to others. Following it, we can reclaim our natural birthright of wisdom and compassion, and work with others to bring about the best in human society.